Have you ever had to endure an interview for a job you knew that you were not going to get? Or an audition for a part in a show that you were certain was going to go to somebody else? You had absolutely no chance but you were obligated somehow to go through the motions anyway. That’s how I imagine it was for Governor Snyder when he was in Washington DC recently trying to convince his Republican colleagues to keep the Medicaid expansion of the ACA (Obamacare). In Michigan, that expansion is known as Healthy Michigan, and there are approximately 650,000 Michiganders who depend on it for insurance. 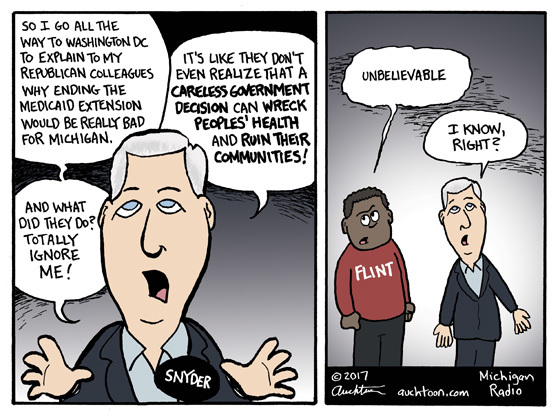 The current Republican plan, the ACHA (Trumpcare), would be the end of Healthy Michigan, and Snyder was trying to point out the social, economic, and political costs of doing that. It’s pretty clear nobody had any intention of listening to him. But points to Governor Snyder. I mean, I’m not letting him off the hook for the Flint Water Crisis (that’s obvious from the cartoon), but I appreciate the effort. It was good to see him sticking up for Michigan citizens, especially some of the more vulnerable. And even if it was all about money, it was still good to see him playing what used to be a traditional Republican role — defending the option that makes the best economic sense. It may have been all an exercise in futility, but there are worse fates. I’d much rather be Rick Snyder as a voice nobody is hearing than Paul Ryan as a voice nobody is believing.